To make this trip a bit more interesting, I decided to visit my spot after the sun had set, which is why all the pictures have strange lighting. This made for a much different experience than usual, and I felt more connected to my place than usual. I think the main reason for this is that when it’s light out, I pretty much only use my vision to take in the world around me. 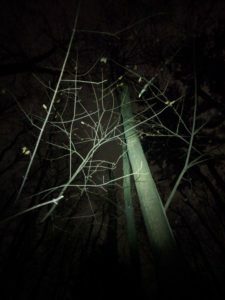 When it’s dark, even when you have a light, you can’t see any further than a few feet ahead, so my other senses, especially my sense of hearing, were engaged a lot more than usual. When it comes to changes since my last visit, there are many. Last time, it was very wintry, with snow and ice the ground. There is a little bit of snow from the storm a day or two ago, but for the most part, the ground is not covered by snow and ice. 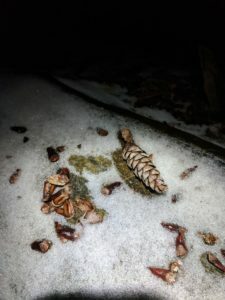 The snowmelt is making the soil very moist, and leaves and other organic matter are mixing with the soil, creating a slippery surface that’s very difficult to walk on. 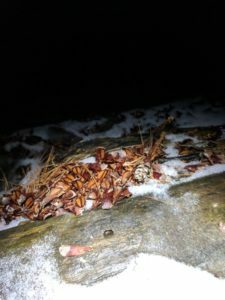 There’s also more signs of animal life than last time; I saw a rabbit walking to the site and there were quite a few stripped pinecones on a fallen tree at my site. If I were to classify my site, I would classify it as a Northern Hardwood Forest. 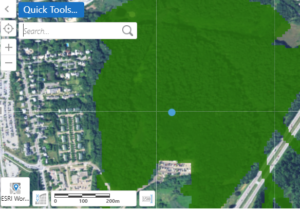 The first distinction t be made was between upland and wetland; while many areas of Centennial Woods could be considered wetlands, my site is on top of a hill and not too close to any bodies of water. Since maples (especially sugar maples) and beeches make up the vast majority of trees near the site, it fits the profile for a Northern Hardwood Forest. I am tempted to classify it as a White Pine-Northern Hardwood Forest, as there are quite a bit of white pines present, but Centennial Woods has experienced many human disturbances, and the presence of White Pines is probably caused by that rather than soil conditions. When I looked at my place on Biofinder, I found a few things surprising. The most surprising is that my spot is marked as highest priority for a rare species. Biofinder did not say what that rare species is, but whatever it is it’s somewhere in Centennial Woods. My spot is also high priority for landscape diversity, but given that it’s a forest in a pretty urban area means that’s really not too surprising. Finally, my spot is marked low priority for interior forest. This is also surprising because given Centennial Woods’ proximity to the suburbs, I wouldn’t think that it really has much interior forest. Exploring nature at night is fun and special! It would be interesting to speculate what the plants and animals are doing when you visit. Are you planning on having another visit in the darkness? It will be increasingly interesting when the weather gets warmer.